It sounds like the plot of a horror movie; you wake up, and start noticing little bits of blood (or reddish specks) on your bed-sheets. As you puzzle over your discovery, you suddenly notice little bite-marks on your arms and legs. And lucky you, you might be the only one in your household that is actually getting bit. Unless you know anything about bed-bugs, what follows probably WILL resemble a horror movie scene: you start to scream hysterically and back away from your bed, grabbing a knife with your hair all frazzled…. okay, maybe not THAT dramatic. friend? Want to keep them? then they feast on your blood. As a result, their colour is a reddish-brown. 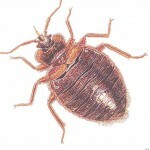 If you think that you might have bedbugs, give Cottage Country Pest Control a call and Ross will be happy to help you. You can reach them at 705.534.7863 or by email at ccpestcontrol@gmail.com. Or of course you can always use the Get a Quote option, which is on the tab up there. This entry was posted in Bed Bugs, Pests and tagged barrie, honey harbour, huronia, huronia pest control, midland, muskoka, orillia, penetanguishene, port mcnicoll, port severn, simcoe, victoria harbour by Ammario Reza. Bookmark the permalink.